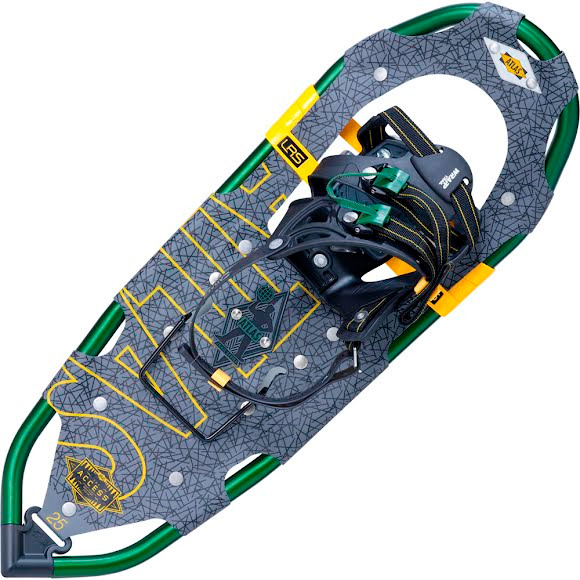 The combination of Light-Ride™ Suspension (LRS), the Wrapp™ Trail binding, and the addition of a heel bar gives Atlas Snowshoes' Access and Elektra Access all the tools needed to confidently tackle uneven, rolling terrain. Delivering natural foot articulation with minimal resistance, the Access and Elektra Access are there for you when the trail heads uphill. The combination of Light-Ride™ Suspension (LRS), the Wrapp™ Trail binding, and the addition of a heel bar gives Atlas Snowshoes &apos; Access and Elektra Access all the tools needed to confidently tackle uneven, rolling terrain. Delivering natural foot articulation with minimal resistance, the Access and Elektra Access are there for you when the trail heads uphill. Comfortable and easy-to-use, the Wrapp™ Trail men&apos;s and women&apos;s bindings are easy to enter and exit while cradling the foot securely. Flexible Nytex™ decking is forgiving and quiet when hiking in the cold, providing durability without the weight. Strong and durable for confident traction on icy terrain that will last for years to come.